There are times I crave for this as its simple, tasty and comforting to eat. To me, this dish is like a stew which goes well with rice or noodles. I simply love stews!! Perfect for rainy weathers. So if you are new to cooking, try cooking stews first as it is basically 'throw-everything-in' kind of dish. It is also easy to wash up too! By the way, I use the concentrated chicken stock as just one drop and it gives so much flavour already. Can last very long as I leave the bottle in the fridge and take it up in times like this. Basically, work with whatever you have in your fridge and would like to add in your dish. 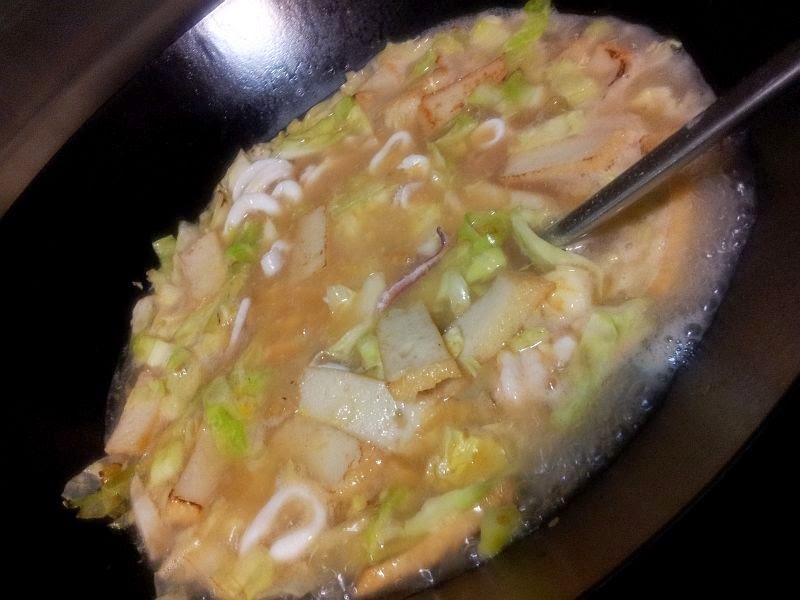 I didn't have any cai xin at that time when I cooked this, so I used cabbage by slicing it thinly. 10) Always taste to see if you are satisfied with it. Balance with whatever sauce you need. It may be more taste. So you add stock or even oyster sauce if you like. You pour the gravy over the rice/ noodles and sprinkle some white pepper! Enjoy!